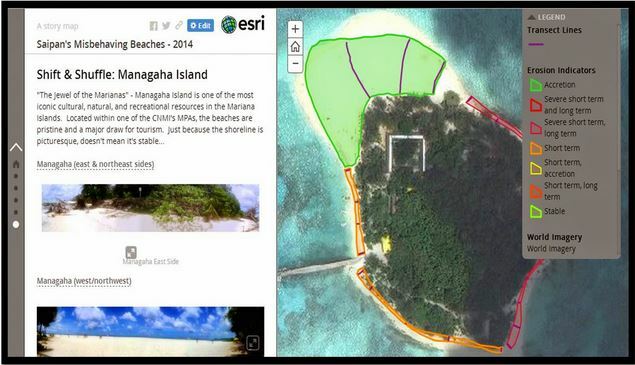 This interactive web mapping application illustrates basic beach morphology conditions along the west side of Saipan using a “map journal” template. Field data and photos were collected, processed, and packaged by NOAA Coral Reef Initiative Interns Zabrina Mae Shai and Marielle Kapileo during June and July of 2014. Field investigations are being conducted by Coral Reef Interns along the same sections of beach and same transects each summer, providing baseline data and photos (plus a little personal touch from the interns) to assess shoreline change over time. The idea is to enrich our understanding of local coastal processes with a little bit of spatial narrative.